It was more than time to head to Denver and make up for that aborted trip back in June due to engine overheating – an issue fixed soon after. Heck, I drove the Minnesota Chicken Run since then and Big Blue was more than ready to power over those Sierra Mountains now! I had several projects to work through since the Minnesota Loop, including the refrigerator repair that I actually did myself! I also had that windshield chip repaired, a couple inherited scratches on a basement door were repaired and painted, and a few more small items were done. We were ready to hit the road! 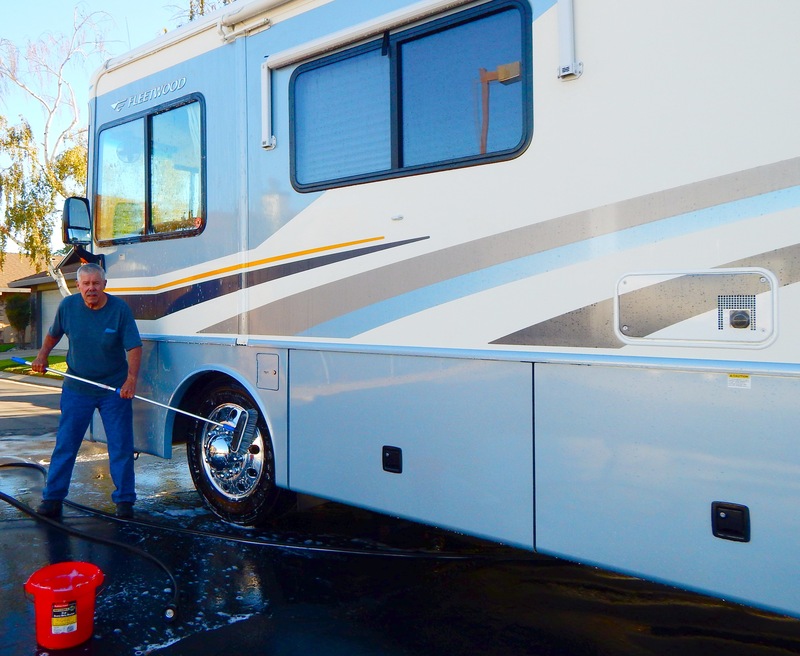 I spent an hour or so each of two days just washing the coach for the trip – it takes two days for this old man. I washed the front and one side one day, then the rear and the other side the next. But it all gets done eventually! When the big day came to load the coach, we worked harder than we should have getting all the groceries, clothing, etc., etc. loaded. Finally, at 1040 we pulled out of our little senior gated community and headed north to Gridley. A field of corn along our drive that appeared to be ready for harvest. Dale’s Roadside Diner out among the walnuts and rice paddies. Dale’s Diners seem to be everywhere! Cows grazing all in the same direction along our drive north on I-5. They almost seemed organized! This is a rare site! This flag is almost always blowing in a strong wind. We dealt with heavier traffic than usual on a weekday drive through the valley, but traffic has gotten worse in just the past year or two, it seems. Once we turned off the interstate onto CA99, the heavy traffic became lighter the farther north we drove. We stopped along the highway just south of Yuba City and my cute lil’ cook and waitress whipped up meatloaf sandwiches for lunch. Yep. There was a Dale’s Roadside Diner out there among the farms and cows, and lunch was much better than the usual Dale’s Diner fare. We arrived at my dear sis’ place just outside the little town of Gridley at 1340. I set up the coach for our overnight stay while Lavonne headed indoors to visit with Gale. Eventually I joined them in the house and we had a good visit. Big Blue parked a couple miles from Gridley, out in God’s Country! We brought along pulled pork for dinner and John whipped up a salad for us. We also brought along fixins’ to make strawberry shortcakes with whipped cream! It made a wonderful dessert and we all had our fill of strawberries. The old folks after a pulled pork dinner and delicious strawberry short cake for dessert. About 1900 I headed to the coach to shower and to edit photos and begin this travelogue. It was a warm afternoon and the air conditioners ran well past dark. Lavonne joined me around 2000. As I clacked away on my travelogue, she played online word games to pass the time. She is a nearly unbeatable Scrabble player! Lavonne called it a day and retired about 2200 hours. I stayed up an hour or so longer as I watched most of an episode of The Century – America’s Time, a History Channel documentary originally aired in 1999 about the 20th century, now available on YouTube. I still enjoy watching it. I went to bed about 2300. Our peaceful country night was interrupted when my sound machine turned off. I don’t remember what time it was, but it was well before sunup. Although we were connected to the 30 amp plug at Gale and John’s home, suddenly all the AC current stopped. I didn’t understand why, but I was so sleepy that I simply turned on the inverter which provided ac current from our big bank of four deep cycle batteries. And I went back to bed. When we awoke and worked through the morning chores, I began looking into the electric issue. All I knew was that the amperage use on our Intelletec (the electricity management system on the coach) read zero. I was certain it was something wrong with the coach since the system was on but not distributing electricity. To make a long story short, and with John’s help, we discovered that the 30 amp plug at the house had failed. When we pulled out the coach plug, one prong was badly burned by an apparent short which blew John’s receptacle – and when checked with my voltmeter read less than 50 volts, far less than the 115 volts it was supposed to read. We then plugged into a regular two prong 20 amp receptacle, and all was well in the coach. What a relief – I thought we may have to cancel the trip since it seemed I couldn’t run shore power to the coach. I was very happy to be wrong!. Ouch! Something blew the receptacle we were plugged into and this was the result. A surge? A faulty receptacle? But the coach was just fine. For breakfast John and I made a run to the local Mickey D’s for breakfast sandwiches and burritos. We enjoyed the fast and easy breakfast as we continued our visit. After a delicious McGriddle sandwich, followed by a breakfast burrito, I headed to the coach and made ready for our day’s drive to Winnemucca, Nevada. It was 1000 hours when we bid my dear sis and John good-bye and headed for Nevada. The drive through the foothills of the Sierras is not so pretty in September with all the brown and dead landscape. But the drive through the mountains is always a beautiful drive in September, full of twists and turns to keep a driver awake. Finally, after many miles of curvy CA20, we reached I-80. Once we were beyond Reno and Fernley, the traffic lightened considerably and we were cruising through the wide open and empty Nevada Desert. I love such driving which is nearly impossible to find in Kalifornistan. We enjoyed the beautiful drive through the Sierras. The scenic Truckee River along I-80 in Kalifornistan near Nevada. Beautiful Donner Lake near the summit. Rice near Gridley seemed ready for harvest. In Fernley, NV we pulled into a Shell station, of all places, for some “cheap” diesel if $3.40 can be considered cheap. With the Pilot and Love stations on the interstate selling diesel in the $3.80 range, Shell was a bargain. At home, Shell and Chevron are always the most expensive stations. After fueling up, we continued our drive toward Winnemucca with a wonderful tail wind pushing us along. In a vehicle with the aerodynamics a brick, it’s good to have a strong tailwind because of the much improved mileage and the quieter ride since the sound of wind on the big, square front is much reduced. We arrived at the Winnemucca, Nevada Walmart at 1630. After setting up the coach and turning on the air conditioners, I headed to the store for my walk and to do a bit of shopping. Having sat all day as I drove, it was good to stretch out for a walk. Big Blue II at the Winnemucca Walmart. Back at the coach I showered and then zapped a small frozen dinner. When I began to update this travelogue I was unable to connect to the internet as it was too slow in Winnemucca. I just gave up on the ‘net and did my writing on a document that I would upload later. I also edited a few of the day’s photos. Lavonne busied herself with games on the computer as we whiled away the evening. My cute lil’ Trail Buddy called it a day and headed to the bedroom a bit before 2200. I mixed a couple cool ones and dug out the DVD set World at War, an interesting history of WWII. I watched it ‘til almost 1100 and then prepared for bed. It had been a long day and I was whipped. I was up and working through the morning chores a bit before 0600. It was a cool morning in Winnemucca and I turned on the heater awhile. When I settled back to enjoy my morning coffee and favorite websites for news and comics, there was no internet. It had gone from slow to non-existent. So I busied myself with this blog and edited more photos. When we continued west toward Salt Lake City at 0800, I was delighted with the prospect of cruising through the spacious Great Basin Desert of Nevada and the very light traffic I’d be dealing with. It was such a relief to be free of the madness of Kalifornistan for a few days! As one who appreciates trains and the desert, I designated this photo as Photo of the Day! Not long after leaving Winnemucca and its lousy ‘net connection, we pulled into the Valmy Rest Area to whip up a quick breakfast. We were in an area well served by AT&T’s usually great 4G ‘net connection. Along with breakfast we were able to check out some of our favored ‘net sites before moving on. In Battle Mountain, NV we stopped at a Shell station that has always had very low diesel prices. Although I had room to pump on only 21 gallons, I gladly did so. These days, $3.31 is a good price – especially when Flying J wants $3.74 per for the same stuff in the same little town. It’s too bad more people don’t shop price on the ‘net or simply call ahead for the price! Dropping into Wendover and a Mickey D’s lunch. These are the usual going price among the Big Boys such as Love’s and Flying J.
I had room for only 20 gallons, but for for a 45¢ discount, it was worth the stop! The day’s drive was aided by a wonderful tailwind that moved us right along and saved some fuel. The ride was quieter because the usual sound of wind across the coach’s broad front was much reduced. A tailwind is a good thing. Our tailwind became a strong crosswind that I had to fight the last 50 miles or more. Such driving gets pretty tiring, but Big Blue is a heavy 34′ coach and certainly is easier to drive in such wind than most. We landed at a different Walmart this trip that is located at the far east end of Salt Lake City. Lavonne had a date with our granddaughter, Erica, who lives and works in Salt Lake City. Shortly after we arrived, Erica met us and we had a lovely visit for awhile before she took Lavonne out for dinner at a local restaurant. I chose, as always, to stay at the coach and have a quiet dinner where there would be no noisy kids running around and I’d be in control of the music. When they returned from dinner, we sat around the coach visiting for an hour or so. It’s always a pleasure to visit with Erica and we seldom get to see her. Erica and Lavonne pose after their dinner out. After our visit we said our good-byes with hugs all ’round and Erica headed for home. We prepared for another night aboard the coach, then spent time on the computers with a good, fast ‘net connection. Parked for the night at one of several Walmarts in Salt Lake City. This one was on Parley’s Way on the east side. After Erica left we worked our way through the usual evening chores, and Lavonne headed to bed. I watched more of the YouTube history documentary The Century: America’s Time, episode 4 which was about the depression. It reminded me of all that we take for granted when The Greatest Generation suffered so much to overcome the depression and then win WWII for us. I also enjoyed a couple cool ones and raised one to my parent’s generation! Our lives are so good and they had a lot to do with that. I went to bed around 2300 and slept very well. Yep. Day 4 was a long day! We originally set out for Laramie, WY but it was so windy there that we chose to continue on for another 50 miles and land in Cheyenne – and we’d have that many fewer miles to drive to the kids’ place in the morning. Cheyenne would be more pleasant, and besides, we usually stay at one of the Cheyenne Walmarts. Salt Lake City, UT as we began our trek east to Cheyenne on Day 4. Our drive was pleasant enough weather wise, with a tail wind moving us along until we got to Rawlins, WY or thereabouts, when a crosswind really got going. A couple electronic signs warned of 50+ MPH winds! The good news was that we were aboard the relatively heavy Big Blue II and she handled the high winds quite well. Scenic photos to click – don’t miss ’em! Pulling the long grade to Parsley’s Summit near Park City, UT. The beautiful Coalville, UT area beyond Park City. Stunning Utah cliffs as we approached Wyoming. …and Wyoming has stunning cliffs, too. The day was not only windy, but very hazy. We figured it must have been smoke from wildfires somewhere nearby, but we never saw nor heard of any. We stopped for breakfast at a lovely Wyoming Rest Area along the interstate. I zapped a breakfast sandwich and peeled a little Clementine orange; Lavonne simply poured a small bowl of oat flakes cereal. We were trying to keep it simple and low calorie – we’d be behaving badly once we got to the kids’ place! For lunch we pulled off the interstate and parked near what appeared to be a dirt country road. Posted for all to see was a sign that read NO SERVICES AHEAD! But with a Dale’s Roadside Diner right there for anyone to see, and especially with my lovely Trail Buddy along doing the cooking and serving, how could that be?! So the setting demanded a photo of this dichotomy. We hadn’t fueled since Battle Mountain, NV and by the time we arrived at the Walmart in Cheyenne, over 700 miles, our fuel gauge read as low as it had ever been – below 1/16 of a tank. As with so many gauges it was not all that accurate; after filling the tank I knew we’d had twice that in the tank when we arrived. I pumped on 77 gallons at the Walmart station which meant that there were 13 gallons in the tank. But that certainly was cutting it closer than we usually do! …so we pumped on 77 gallons! Compared to the nearby Flying J, we saved over $20 on that one fill up! After fueling up, which took three swipes of our credit card to accomplish due to their $100 limit, we simply drove across the lot and parked for the night. It was good to be “home” after such a long drive! When we were settled in, we walked to the store and did a bit of shopping – and it counted as my walk for the day. Back at the coach we whipped up dinner, then tackled the evening chores. Lavonne played word games on her computer as I edited photos and updated this entirely too wordy blog – but it kept me occupied! Our evening in the coach was comfortable and we slept well. We’d be with the kids in Greenwood Village by noon the next day and we sure were looking forward to our visit. The day dawned cool there in Cheyenne, and I ran the heater awhile as soon as I rolled out of bed. We wanted to get an early start as I had to dump our tanks at a nearby Love’s station before we continued south. We pulled out of the lot a bit before 0800. Morning at Cheyenne on Day 5 – we’d soon be with the kids! Our first stop was at the Love’s station where I ponied up $10 for the privilege of dumping our holding tanks. About 20 minutes later we continued south toward Denver, dropping nearly a thousand feet as we drove. Before we reached Denver, we took a loop to the east that added about four miles to the drive but missed the intolerable downtown Denver traffic. We were welcomed into Colorado by the usual bison silhouette. I-25 is an absolutely rotten highway – C’mon, Colorado, you’re making Kalifornistan look good! …and a lovely Colorado Farm. I can’t win! I was so happy to fuel up for $3.14 in Cheyenne, then found it 20¢ cheaper just down the road. This seems to always happen. We stopped at a rest area in Colorado for breakfast, and whipped up about the same breakfast that we’d been enjoying the past several days. I was about due for eggs and pancakes and would likely find just such a breakfast while a the kids’ place. I just can’t resist shooting the skyline of Denver when I see it. We arrived at Allen and Nancy’s lovely home at 1100 hours, safe and sound and plumb tickled to be there. Allen showed up from work a while later with Chick-fil-A lunch to share with us. The three of us sat on the patio together and caught up with one another’s happenings as we enjoyed the Chick-fil-A. We made it to Allen and Nancy’s in Greenwood Village, Colorado! It was good to be with Allen and Nancy after the long drive to see them. We visited much of the afternoon on their very cozy patio. I took time for my grandpa nap while others continued to visit. I think. Eventually talk turned to dinner and we decided on Boston Market take out – and it was an excellent choice. Nancy’s mom, Norma, who lives nearby, would join us for dinner on the patio. I chose three pieces of rotisserie chicken, dressing, sweet potatoes, mashed taters and gravy, and corn bread. But somehow my sweet potatoes went missing, so my loving Lavonne shared hers with me. It was such a feast! I also had a cinnamon apple dish with some ice cream. Goodness… but it was a lovely dinner with family and we had a grand old time together. Allen and Nancy’s gorgeous backyard and entertainment area. It is a beautiful place to hold a gathering of the clan. We continued visiting on the patio after dinner for a spell, and a bit later I headed to the very comfortable basement “apartment” for a piping hot and long and glorious and wasteful shower. ahhhhhh. It was a real pleasure after several days of taking fast and efficient RV showers and I made the most of it! I then headed to the coach for the night, and my dear Wifey would, as always during these visits, spend her nights in a guest bedroom in the house as she finds that more comfortable. Choice is good! I watched more of the The Century: America’s Time documentary online and stayed up ’til midnight – something unheard of for me – but of course that was 2300 home time! I slept very well and awoke about 0700. The first order of the day after morning chores was to brew my coffee, then join the rest of the family in the living room – that’s a tradition when the family is together. We discussed the plans for the day, and they would go shopping together after breakfast while I stayed put – as I usually prefer. I had house cleaning to do, and I wanted to get started on it when they headed out to do the shopping. But first I took my walk of the day while it was still cool. The city has a lovely park two blocks away and walking there plus one lap around the place made my 25 minutes. It’s a beautiful place and I envy them such a lovely, nearby park. The beautiful nearby park where I enjoyed walking. As I walked to the park, these deer watched me closely. The kids’ neighborhood has lots of wildlife around. …it completely pooped me out! Here it’s Miller time with a cold Corona! The time I spent resting on the steps of the coach with those cold beers was an unusually splendid moment. I was whipped, but happy with my work and truly enjoying the beautiful morning, the lovely surroundings and, well… the good life! The day passed as it usually does when visiting Allen and Nancy. The shoppers returned home after a Mexican lunch, and they were kind enough to bring a couple tacos home for the Old Man. Then they rested awhile before going grocery shopping for the planned dinner feast. Sometime during the afternoon we played the card game Golf, so named because the fewest points wins. I didn’t win but I had the most points! Everyone worked on preparing the great meal we had – except me. Norma, Nancy’s mom, joined us again and she, too, was elbow deep in the preparations. Then after the big meal, I did most of the cleanup because, after all, I am very good at unskilled labor. We all have our talents! Around 2100 the party broke up as everyone moved on to other things around the house. I bid my lovely Wifey good-night, then returned to the coach. It had been a very lovely and productive day. Our Sunday unfolded much as Saturday did. We stayed at home most all day. One shopping trip was made to find Lavonne a larger laptop computer. They came home with a 15.5″ Dell. Nancy, Allen and I set it up for her and she seemed real pleased with the larger size. Everyone was involved in setting up Lavonne’s new, larger laptop. Having cleaned the floors of the coach the day before, I continued the housekeeping as I dusted the whole place and then cleaned the sinks and bathroom. We hunted and gathered again for lunch and dinner, and with all the leftovers from the prior two nights, there was plenty for everyone. After dinner we sat around the kitchen table and played more Golf, the card game that seeks the lowest score, as in golf! We spent several fun hours playing the card game of Golf in which we all tried for the lowest score. I headed to the shower about 0800 and then to the coach for the night. I looked forward to the continued trip to Pittsburg, KS the next morning. From Kansas I planned to continue east for a while, then head north into Iowa and work my way home through the north states once again. Unless, of course, I changed my mind. Bums don’t have real firm plans. My loving Trail Buddy, Lavonne, would continue her visit with Allen and Nancy, and would fly home from Denver at a later date. If our destination was family, she’d be all in, but bumming around the country as I like to do just isn’t her thing. And I understand that completely. The morning of Day 8 was a busy one as I prepared the coach for continued travel east. I had to load on fresh water, roll up the power cords and put them away, raise the jacks, etc. I visited with the family awhile that morning as I thanked Allen and Nancy for the good times and said my good-byes to them. I shared a big hug and good-bye kiss with my dear Lavonne – I would see her again when I got back home. And then I pulled out of their driveway at 0800 and headed for Dodge City, Kansas and a few days of bumming around the back roads of the heartland! I dealt with a bit of traffic through the Denver area, then was on the much less traveled country roads of Colorado. How I loved to be back in that open country and those lightly traveled roads! My first stop was Elizabeth, Colorado’s Walmart store where I planned to just pull in and have breakfast at the local Dale’s Diner. And there I discovered diesel selling at the nearby Murphy’s USA Station for just $2.93 per! I had very little room for fuel having just filled up in Cheyenne, but I had to have some of that cheap stuff! I filled the tank with just 17 gallons, and I was a happy camper. Next, I zapped a diet breakfast sandwich and peeled a little Clementine orange for breakfast. And I continued east. Happiness is finding “cheap” diesel. My happiness is tempered by the memory of 25¢ diesel back in my trucking days. The little town of about 700 souls had a very modern police SUV with all the lights and flashiness for dealing with real crime. I’ve driven very, very carefully through the money-grubbing little town ever since. And I’ve never spent a dime there – other than the mugging! The little burg of Kiowa, Colorado where passing tourists often make financial contributions to the town’s coffers. I believe tourism is big business for them with the help of their Blue Meanies. … and about the same area taken September 17, 2018. I pulled into a supermarket lot in Lamar, CO and whipped up a sandwich for lunch. As I continued east the wind kicked up and I fought a crosswind the rest of the day. But the drive was such a pleasure as I cruised through rural countryside the whole day that I didn’t think much about the wind. I was lovin’ it! And it was pretty darn warm – it was in the 90s all afternoon and I ran the dash air the whole time. Indians on the warpath! This metal sculpture startled me at first. A local rancher was having fun with the passing motorists. Once in Kansas, the agriculture was much more diverse as I drove by many fields of corn – much of it no doubt would be winter feed for the countless critters in Kansas. I drove by several large feed lots where the cattle were getting fattened up for market. Cattle trucks were about as numerous as pick up trucks in Kansas, it seemed, as the livestock is mooooved about the area. Cattle trucks seem to outnumber pickups in Kansas. They are everywhere and they are usually in a big hurry. Oh… and they are usually stinky! I arrived in Dodge City, KS at 0600 and settled in at the local Walmart for the night. The wind blew incessantly from the south and it was very warm! I ran the generator and house air conditioners ’till almost 2200. Welcome to Dodge City, pardner! Jacks down for the night at Dodge City’s Walmart. It was windy and hot all afternoon and I ran the air conditioners for hours. This was my first visit to Dodge City since our ill-fated trip of last October. We spent our last night aboard our beloved Cecil the Diesel there, before the awful accident in Kinsley, KS the next day. I shopped for some supplies and groceries at Walmart, and took my walk around the area, visiting the nearby Hobby Lobby. Back in the coach I edited photos, began the day’s blog, and then whiled away the evening watching more of the online documentary The Century: America’s Time on YouTube. I finally went to bed about midnight and slept very well. The drive on Day 9 was windy, hot and pleasant. After all, I was cruising the back roads of Kansas and enjoying the solitude and rural beauty of the heartland. And the day would include some of the best fried chicken I know of – Chicken Mary’s just a few miles outside Pittsburg. The drive would also take me through, successfully this time, the intersection near Kinsley, KS where we had had the terrible accident last October 3rd. As I approached the intersection, only about 35 miles into the day’s drive, I recalled that awful day. Highway 56 was blocked off this time, and in reality it was no longer an intersection. I presumed the closure was due to construction, and how I wished that had been the case back in October. I often think of the wife and two young sons who lost their husband and dad that day, and the whole incident was just such a loss in every way. The intersection where, last October, we collided with a small van that pulled out in front of us from US56, the road to the right which, in this photo, was blocked off. Our beloved Cecil the Diesel was totaled and the other driver died at the scene. This time I continued my trip, something that, for some reason, I wanted to experience. I continued on toward my goal of Pittsburg and Chicken Mary’s for dinner. The afternoon was windy, and it was incessant although not more than about 20 MPH. It was a crosswind which makes the drive more tiring. It was a long, hot drive, and it was good to pull into Chicken Mary’s parking lot for my much anticipated chicken pig-out. I had to fire up the generator and run the main air conditioner as I went in and ordered. It was hot, but mostly humid. The air conditioner ran the entire time at Chicken Mary’s. Chicken Mary’s and Chicken Annie’s have sat side by side, in competition, waaaay out in the boonies near Pittsburg, Kansas for over 80 years. Both were started in the 1930s during the depression when two local men were disabled and their wives began serving chicken dinners and sandwiches in their homes. I’ve eaten at both during past trips and they’re about the same in my book. This trip I decided to eat at Chicken Mary’s. Click for larger photos of the Chicken Mary’s adventure! Chicken Mary’s – and Chicken Annie’s – are so far out in the boonies that it’s hard to believe they’ve been there 80 years. Now… this here is one happy camper! The dinner was all that I expected and I enjoyed every bite. I ordered three thighs, and sides of mashed taters and gravy, coleslaw, and apple sauce. Also included was a chicken leg, a bonus, I supposed, for my winning smile and good looks. After the delicious meal, I headed for town and a local gas station where I fueled up with 79 gallons of diesel. The price was a bit higher at $3.15 per, but still a bargain by Kalifornistan values. Diesel was still cheap by Kalifornistan standards. Jacks down for a very humid night at the Pittsburg, Kansas Walmart. Kansas must be very profitable for farmers. The land grows huge crops of corn and soybeans and sorghum. And the hundreds, if not thousands of wind turbines generate electricity high above the many crops. Add to that the oil wells that appeared in a few of the fields, and one must come to the conclusion that Kansas farming must be very rewarding financially. What great use of the land this is! Crops grow below as wind turbines generate electricity above. A train derailment of loaded grain cars. It was an awful mess. …just a pretty hay field. And yes, it was awful windy. It always is! That would explain the many wind turbines, I suppose. Two red barns for the price of one – I could not resist! Yet another pretty hay field. When I pulled into the local Walmart and settled in, I had to run the air conditioners ’til bedtime because of the awful humidity; it was at 80% and I’m used to near zero back home. Even in the high 70°s late in the evening, to me the humidity was very uncomfortable. I spent the evening editing photos and watching more history documentary on YouTube. I checked the outdoors from time to time, hoping to open the coach up and let the cool of the evening in, but that didn’t happen. I finally called it a day around 2330 and headed for bed. It had been quite a day. I slept well in spite of the heat, having moved the little table fan to the bedroom for the night for a bit of comfort. I was on Central time, and awoke at 0715 when back home it was just 0515. Perhaps I was getting used to the changing time zones. The first thing after morning chores was to get the photos and travelogue for Day 9 posted. And nearly two hours later, I was done. I had planned to drive to Hannibal, MO that day, but because of the heat and humidity I’d contend with there, a change was quite possible. I would decide as my day unfolded. I pulled out of Pittsburg at 0940 and within just seven miles, was in beautiful Missouri. The place was so green! I loved the very scenic drive through all those wonderful green and rolling hills – and the Ozarks! Welcome to Missouri! Pardon the buggy windshields; I did wash ’em good when I stopped for breakfast, but the clean didn’t last long. Lots of bugs love Missouri, too! I pulled into a truck stop and found a place in the huge lot all to myself for breakfast and to clean those monster windshields – it seems they’re about an acre in size when it’s time to tend the bug collection. Continuing my diet after the chicken pig-out, I had only a Jimmy Dean Delight frozen breakfast sandwich and a nectarine. Back on the road, I enjoyed a nearly windless day for a change, and what breeze there was usually pushed me along as a tailwind. Less wind is good. The day was very warm and pretty humid, too. I’m not used to high humidity, and if I didn’t have the coach air conditioners to keep me comfy, I’d have been elsewhere! I think I have a hay field obsession – but really, isn’t that a beautiful rural scene?! Eat your heart out, Kalifornistan! It’s an outrage the difference in prices and mostly due to our idiot politicians in Kalifornistan! …and there it was – a Dale’s Roadside Diner at a truck stop along side US54. They’re everywhere! Lake of the Ozarks – it was huge and this doesn’t begin to portray it. It was early on that I decided I would drive to Hannibal, MO for the night because, by gosh, I wasn’t going to be a sissy about hot weather and humidity. Well… if it wasn’t for the air conditioners I certainly would be a sissy – and I soldiered on! I saw a lot of harvested fields during the day’s drive. Here they’re loading corn from the harvester to be trucked to storage. Another neat and tidy spread along the highway. Gorgeous! I was on the Avenue of the Saints as I pulled into Hannibal. I was surprised that they let me drive with the saints! RAIN!! I finally drove through rain – for about five minutes. That was all. Rats. Crossing the Mighty Mo – the Missouri River. This lousy shot was the best I could do. A very neat and tidy spread in rural Missouri. Once settled in at the Hannibal Walmart store, I set off for my walk around the inside of the store where it was cool and comfortable. But my gosh – it was awful hot and humid outdoors. I parked the coach with the rear to the sun to keep it off the sides so as to help keep it cool inside. I ran the house air conditioners all evening. After dark I would occasionally open the door to see if it was still hot – and it always was, and it felt much like a sauna. I decided that evening that as much as I enjoyed beautiful Missouri, I could never live there! After my walk and evening chores such as dinner and shower, I edited photos for a long time – and, as always, I shot waaaay too many and deleted most. I mixed a couple cool ones and kicked back to watch more of the documentary The Century: America’s Time – what a great story of our history it is! I called it a day and headed for bed around 2300 Central Time. It had been a long and pleasant day and I slept very well. I rolled out of my very cozy bed about 0615 and began another day of traveling the beautiful heartland. According to the coach outdoor thermometer it was already near 80° – likely a warmer reading than actual, but still warm. And a cool breeze blew lightly that wouldn’t be cool for long. After morning chores I began the day’s travelogue for the day before. It’s a time consuming pleasure, and some folks like to follow my wanderings. For sure, I would enjoy reading and re-reading this travelogue in the future. The day began with a breeze and ended with a real blow-hard thunderstorm – but I’m getting ahead of myself. I did remember to clean the monster windshields before leaving – not that it lasted long. I pulled off here for lunch at their local Dale’s Roadside Diner. And Old Glory attests to the incessant wind. A beautiful Missouri spread that I coveted. US 36 wanders through beautiful Missouri and seems a lot like an interstate much of the time. Missouri soybeans to the horizon! I don’t know what the politics were all about, but those flags told my story of the windy day very well. More US36 and lovely, green Missouri. The day’s drive was almost all west and northwest, and a heck of a blow came from the south. For the little time I headed north it made for a welcome tailwind, but nearly all day it tried to push me into the ditch. And once again my fridge was too warm. Those two issues could have depressed me – but I refused. After all, I was blessed with the good fortune to be doing exactly what I wanted to do, and I enjoyed being a comfortable and mobile bum! The wind was an annoyance; the fridge more a matter of endless frustration considering the history I’ve had with the &%$#@!! thing! I knew I needed help, and looked online for RV repair. The town of Fremont, only about 25 miles from my destination of Blair, NE listed a fellow who had excellent reviews. I could easily spend the night at the Fremont Walmart instead, so I called and left a message about my issue. He called back! He agreed to meet me at the store! I was somewhat relieved that he seemed up to his Yelp reviews. So on to Fremont I drove. Now, I have been wishing and hoping for rain, and other than the five minutes of sprinkles the prior day, I hadn’t seen a drop the entire trip – and that was unusual in the heartland. Well! As I neared Fremont, a huge thunderstorm was blackening the skies ahead. I was encouraged – something may have been going my way on an otherwise frustrating day. When I pulled into the Fremont Walmart the wind was blowing like heck. I parked the coach into the wind, dropped the jacks and set up for the stay, and that’s about when the rain and thunder broke loose – it was a beautiful thing! The rain came down in sheets as the thunder pounded. I loved it. I just sat in the coach and enjoyed the show. This still confuses me; how did they build this freeway way back in the 17th century?! A lousy photo of the Mighty Missouri River. I timed my drive around Omaha to join in on their evening commute. Why would I do that?! The RV repair fellow pulled up next to the coach after the cloud burst was about done, and after pleasantries, he got to work. He discovered right off that the “burn box” where the little flame powers the fridge circulation was full of debris and likely was the issue. He cleaned it out and was satisfied that it was fixed. However, it takes hours for these RV fridges to cool down, and I wouldn’t know ’til the following morning if he actually fixed it. But I saw all the debris he cleaned out, and the healthy blue flame when he was done, so I had high hopes. He also spent perhaps 45 minutes diagnosing the bedroom slide which quit working at the start of this trip. He showed me quite a bit about the system, and also where the problem probably was, but did not have parts nor did I have the time to wait for parts. For $120 I trusted that the fridge was fixed and I learned a lot more about the slide. I think it was worth changing to the Fremont Walmart – and I would know more about the fridge in the morning. …and sure enough! I finally got the storm I’d been hankerin’ for. It was wonderful! As for the storm, I was one happy camper! It poured all evening and it was such a treat after all the heat and wind and humidity! I sure miss having weather back home because it’s the same day after day after day – nothing but sunshine! I spent most of the evening editing photos and updating this travelogue. I did take time for a Sweet Onion Chicken Teriyaki sandwich that I bought at the Subway in Walmart. It was delicious and I was ready for something better than my usual frozen dinner. I would be on Mountain Time the next day, just one hour later than our home time. By Mountain Time, I hit the sack at about 2300 and slept well. I was up and at ’em a little before 0600. I was pleased that the mess on the windshields was cleaned pretty well during the thunderstorm of the prior evening. It really was a glorious storm! The rain came down ’til well after dark. As a matter of fact, the whole coach got a fair to middlin’ wash.
After morning chores the big moment came… it was time to check the fridge – and it was just 48°. That’s not so great, but it darn sure beats almost 60°. As slow as these propane RV fridges are, I hoped that it would cool even more through the day. If not, I was out $120; I darn sure wasn’t going to call the repair fellow out again because I wanted to hit the road. The fact that the freezer worked so well and the fridge section didn’t was a mystery to me. Morning at the Fremont, NE Walmart before heading across nearly the entire length of Nebraska. This is the first photo with my new Nikon Coolpix B500 camera I had just purchased at that store. I pulled out of the lot about 0830 and headed across Nebraska to Chadron, 400 miles away through nuthin’ but farm and ranch land and a few small towns. Lonely highways make for my favorite driving, and I thoroughly enjoyed the day. One of many Nebraska feed lots – this is where our steaks and burgers come from!? US275 and US20 were like this much of the time and I loved it! Yes… I’m still fixated on hay fields. This was a huge, wide something and I gave him plenty of room. He had pilot cars front and rear. Sharing the road Nebraska style. Of course I had to deal with more wind. It was a cross wind nearly all day, but in the afternoon lessened considerably and finally, for the last hour or so, was a tailwind. I love tailwinds. I stopped somewhere along the morning’s drive and zapped another egg and sausage sandwich, peeled a couple little Clementine oranges and called it breakfast. I was hankering badly for a good pancake and fried egg breakfast, but the one nice restaurant I saw was on the wrong side of the street and I couldn’t make a U-turn at the next corner. I had to just keep going but there’s a good restaurant meal in my immediate future. This big farm home seemed like the classic farmhouse. Just a barn with character. This pretty red barn looked like new. I was surprised to find a Mickey D’s in the small town of O’Neill, Nebraska, so I celebrated by stopping in for a large coffee and a small McFlurry. And I didn’t get sleepy the rest of the day. As the afternoon rolled on, I thought I’d skip lunch since I had the McFlurry, but then again, in the small town of Valentine, Nebraska another McDonald’s beckoned me. I stopped there for two Filet-O-Fish sandwiches. Well… they were two for $5 and I like a bargain! After my long drive I finally arrived at the Walmart in Chadron, NE about 1700. After settling in, I headed to the store for my walk. I would have dinner about 1830, and I was not looking forward to one of my usual meals. I bought a frozen sweet & sour chicken dinner to quench my appetite for Chinese, and enjoyed that for dinner. Big Blue II at the Chadron, NE Walmart for the night, pointed into the predicted wind. After a shower and dinner, I sat down to edit the day’s photos, most of which were deleted because I shot too many. Again. As the evening wore on and I was writing this blog, the wind kicked up again – and it seemed pretty serious. When it can make the coach rock a bit when I point it right into the wind, even with the jacks down, it must be about 20 MPH. The forecast predicted winds to 24 MPH overnight, then calming down pretty much by morning. Gosh, I hate wind! But I was pleased to have a pretty cool day and the night temps were predicted to fall to 50°. I think that beats running the air conditioner half the night to avoid the heat and humidity, but I still didn’t like the wind a bit. I enjoyed a couple cool ones as I watched more of the history documentary The Century: America’s Time. I couldn’t stay awake and headed to bed around 2300 and slept well. After morning chores I discovered that the batteries were low, and things weren’t working right. I took off, hoping they’d charge, but they didn’t. I would have to get those four deep cycle house batteries checked out, so after the satisfying Denny’s breakfast of pancakes, eggs and sausage in Rapid City, SD that I promised myself, I looked up the local Interstate dealer and followed the navigator the few blocks to have the batteries checked. As it turned out, the issue wasn’t batteries, but the lack of charging them. As I drive down the road, the big Cat diesel’s alternator is supposed to charge them, but something went wrong. The house generator still charged them, so it was likely a bad battery isolator that is much like a solenoid. I didn’t even know where it was located so I couldn’t get to it. I preferred to take care of it back home – but I needed to run the house generator an awful lot ’til then. Or I could stay at RV parks at night and be plugged into the grid, but I really didn’t want to do that. I drove through the Buffalo Gap National Grasslands. Prairie driving is a wonderful thing. This is the Prairie View Methodist Church that sat atop a hill and was visible for miles due to the vast emptiness of the prairie. If old houses could talk, I’d love to have a chat with this old place. Imagine the stories it could tell! This Pronghorn buck was seemingly all alone and oblivious to the roadway and passing traffic. Parts of the prairie were teeming with Pronghorn antelope. The day’s drive was a beautiful adventure across the prairie and included portions of Nebraska, South Dakota, a small corner of Wyoming, and on into Montana where I drove half way across the state to Billings. I am pleased to say that wind was not a factor, nor was it terribly hot. It was a wonderful day to travel and I drove a very remote US212 that included quite a show of native Pronghorn antelope. The drive was so remote that I had no phone service much of the time. I began the day’s drive in Nebraska, drove into South Dakota, nipped a corner of Wyoming, and then drove into Montana. I was welcomed everywhere! I drove through beautiful, remote country most of the day. A herd of Pronghorn antelope. The day was the beginning of fall, and it sure looked like it. At the Billings, MT Walmart I took a walk in the store, bought a few items I needed, and also bought a Subway sandwich for dinner. I spent the usual evening aboard the coach, editing photos and writing. I watched the history documentary about an hour or so as I enjoyed a couple cool ones. I turned off the generator and headed for bed at about midnight, and slept very well. It had been quite a day. I rolled out of bed a bit after 0630. The night was quiet and I slept well. But the first thing I did was discover that I could not start the big generator again. The house batteries read 12 volts and should have started it. I went through the same routine with the little generator as the prior day, and the big generator started. Morning at the Billings, MT Walmart before continuing the drive toward home. I moved on with my day tending to morning chores and getting the coach ready to roll. I prepared a travel mug of coffee, and hit the road at 0900. I was getting pretty confident with how how to deal with the electrical issue. I learned that the 2000 watt inverter uses a fair amount of juice just being on even though I may may not be drawing AC current from it. It’s function is to convert 12 volt DC to 110 volt AC current for running such things as the microwave or the coffee maker without having to turn on the generator. I was leaving the inverter on when I didn’t need to, and I believe that was why the batteries were run down again that morning. The only draw on the inverter overnight is charging the computer if necessary and running my sound machine overnight – and just having it on probably takes more juice than the computer and sound machine. So I put batteries in my sound machine and would keep the inverter off all the time. During the evenings when I ran the generator, the computer and other electronic gadgets could charge. Now… was all that explanation necessary? Probably not! Montana is such a beautiful drive that I cannot leave the camera alone for even ten minutes. Even during a drive late in September when much of the grasslands have dried and turned brown, the place is beautiful. The mountains are majestic and the rivers add much to the beauty. Airplane bodies – heading to final assembly somewhere? Probably Boeing? I don’t recall seeing such a strange load on the railroad. Montana is majestic as well as beautiful. Dropping down from the 6,385′ Homestake Pass on a rainy day. I’d like to record what I did for breakfast, but for the life of me I cannot remember what I ate or where I stopped – and yet they let me loose to bum around the country! I do recall lunch, however, and all the things I got done in just one stop. I drove through all three (I think) rest areas along the morning portion of my drive looking for a RV dump. I had to dump my tanks as I hadn’t dumped them since the day we arrived at the kids’ place near Denver, nor had I loaded on fresh water since the day we left the kids. None of the rest areas had a RV dump. Most don’t, granted, but when I do use one, they’re always free and free is good. I recalled dumping at the tidy Indian Creek RV Park in Deer Lodge, Montana during my July chicken run. I had that as my ace in the hole if no others were available – and they charged just $5. When I neared Deer Lodge I chose to turn off and pull into the RV park to dump the holding tanks and load on water. Everything went just fine at the RV park and Big Blue was greatly relieved. Next, I drove across the street to the Mickey D’s and ordered a pretty late lunch. Since Filet-O-Fish were selling two for five bucks, I ordered two. Again. And a 4 piece McNugget box. I paid the youngster and waited for my order. And I waited and waited. They were shoving orders through the drive up window one after another while those of us inside were served very slowly. I finally walked up to the counter and told the youngster that I wanted my order NOW, or I wanted my money back. She made a couple weak excuses as she raced about assembling orders, and in five minutes I had my order. I discovered two pies were thrown in as well – perhaps a peace offering, perhaps a mistake. Either way I simply took ’em and headed to the coach for lunch. The very sweet young lady that waited on me was always kind and never lost her cool. Perhaps they were short handed. At the coach I checked online for diesel prices in Missoula, my destination, and found the prices right there in Deer Lodge at two stations to be about the same. After pigging out badly with the two fish sandwiches and the McNuggets, I pulled next door to the Sinclair station and filled up. My visit to Deer Lodge, Montana was very productive! While pigging out on my fish sandwiches, this 1951 Chevy came out of the station across the street, pulling a new, but retro styled travel trailer. I heard the roar of a healthy V8 as he drove by, and judging by those tires, that car was well modified to pull that trailer. Back in the 50’s we (my mom, sis and I) had a fairly new 1951 Chevy and a travel trailer, so this was quite a sight for me. Here’s my mom with our 1951 Chevy which she purchased from our Uncle Orval about 1952, and the homemade trailer was part of the deal. This is why that 1951 Chevy pulling the retro trailer (above) was such a moment for me. My twin sis, Gale, and I were likely in the car when this photo was taken in about 1955. We would have been 11 years old. Eighty some miles of wind-blown driving later I pulled into one of (I think) three Walmarts in Missoula, and settled in for the night. I took a walk in the store and did a bit of shopping for a few items I needed. Back at the coach I worked through the evening chores including a shower and dinner of, I hate to admit, a small apple and two Mickey D’s pies. Ugh. What a pig-out day it had been. I was, after the piggy day, officially back on the diet bandwagon! I spent much of my evening time editing photos and writing this blog as the generator ran continually the entire time. I was pleased that the gauge indicated the batteries were drawing just three amps after a couple hours run time, while the prior night they began by drawing 13 amps! That indicated to me that they were charging up pretty nicely. And while I wrote of issues aboard the fine motor coach known as Big Blue II, I could also report that the fridge cooling issue seemed to be fixed. I checked it as I whipped up a couple cool ones and it read about 38° even though it was set at ‘5’ when the coldest setting was ‘9’. I watched about an hour of the history documentary that I had been watching most nights of this adventure, then headed to bed at 2300. I awoke about 0530 and first thing, I pressed the start button of the big generator and… I was pleased to find that it fired right up! It seemed that I had figured out how to work around the battery charging issue. And then I turned up the heaters and went back to bed a few minutes while things warmed up. I had set the thermostat at 65° in the bedroom overnight. Morning at the cool and cloudy Missoula, Montana Walmart. I worked through the morning chores, then pulled out of the lot about 0815 and began my third week on the road. I figured I’d be home Thursday if all went as planned. On Tuesday I would drive to my old high school buddy’s place in Keizer, Oregon. Al and his wife, Betty, were willing to put up with me for another night in their driveway. Al installed a 30 amp plug at their driveway just for me some time back, and it would be good to charge the batteries overnight for a change. I-90 runs along the Clark Fork River for miles and crosses it time and time again for over 70 miles. This is one crossing I made. Beautiful Montana – it really is something special. My day’s drive saw some extremes. I began in the mountains of Montana where everything is beautiful and cool – into the 40° range when I got up. I ran the heater all morning trying to stay warm. Once across Lookout Pass into Idaho things were warming up and the drive was still beautiful. Then as the day wore on, I drove down the very warm and ugly US395 from I-90 to Hermiston, Oregon. Through Washington it was dry as toast the entire drive. I also enjoyed the splendid and near solitary morning drive in Montana and later drove through Spokane which was very busy and overrun with traffic and people. Yep. The lonely highways that seemed to be all mine through the wonderful heartland were just a memory. I tried not to think of the madness of Kalifornistan that I would face in the next two or three days. During the drive through beautiful Montana I took a lot of photos of the autumn colors and a few are shown here (Just click ’em.) and many photos were deleted because – as usual – there were just too many of them. The colors were just getting started and most trees were just beginning to change. I stopped at a rest area somewhere in the mountains of Montana and zapped a breakfast sandwich and toasted a small, frozen waffle. For dessert I enjoyed a small Clementine orange and a Fuji apple. I was, really, back on my diet! The beautiful Lake Coeur d’Alene near the town of the same impossible name. Spokane, Washington and I was re-introduced to the world of too many people and cars. …but turned ugly soon after. The dryness was not pretty. Crossing the Columbia River into Oregon. For lunch I pulled into a small truck stop restaurant/gas station on the long and unsightly stretch of US395 in Washington. There I made a ciabatta sandwich and again had an apple and orange for dessert. Jacks down at the Hermiston, Oregon Walmart for the night. I pulled into the Hermiston, Oregon Walmart about 1530. I took my walk in the store and bought a couple items I needed, then headed back to the coach and cleaned the windshield and did a few more chores. For dinner I zapped a frozen turkey dinner and again had an apple and orange for dessert. I had a good diet day and it was about time! After my shower it was time to begin this travelogue. As I began, I had a hankering for dessert. I should have resisted, but I walked into the store and bought one of those lo-cal imitation pints of ice cream. The lowest calorie choice was a cookie dough flavor with only 150 calories in the whole pint. I took it to the coach and sort of enjoyed it. It fell short of real ice cream pretty badly. And I continued on with the photo editing and writing. After the blogging was done, I mixed a couple cool ones and then watched a bit more of the history documentary I’ve been watching this whole trip, The Century: America’s time. There are 15 parts to the story and is available on YouTube. I ran the generator for two and a half hours during the evening to be sure the house batteries were charged well. At 2300 I headed to bed. It had been a good day. It was a cool, autumn morning in Hermiston, Oregon that day at around 40°. The first thing to do after rolling out of my cozy bed at 0600 was to fire up the generator and was pleased that it did so easily. Then I turned up the heater and the water heater and went back to bed for a few minutes to let the place warm up. I worked through the morning chores, looking forward to my visit with my old high school buddy, Al, and his lovely wife, Betty, in Keizer, Oregon. The drive would be a relatively short one of just 220 miles or so and I pulled out of the lot at 0700. I hoped to wash the coach if the opportunity presented itself in the form of a wand car wash that could accommodate Big Blue. And I wanted to fuel up if I could find a decent price. I struck out on both counts as I had enough fuel anyway, and I’d find a better price in Keizer than I’d seen. And I didn’t see a car wash I could fit into. The wash would wait ’til I was back home. I drove to I-84 which was just south of town, and was on it most of my drive for the day – to just east of Portland where I took I-205 south. I-84 ran along the Columbia Gorge for miles, and it is a beautiful drive. It is often windy, but that day it was absolutely calm and much of the river was almost like a mirror. This timber farm is along I-84 not too far from Hermiston. They were actually falling trees as I drove by, so I guess this shows how large the trees get before cutting – and just as they were beginning to show their autumn colors, too. I saw a logging truck loaded with logs the size of these baby trees. Back in my log hauling days, I’d have been embarrassed to be seen with such a bunch of twigs – but then again, these were likely hardwood logs and probably don’t grow as large as the conifers. I was soon heading west along the Columbia Gorge and the Columbia River. The Columbia is a very large river at over 1200 miles long, and by volume the fourth largest river in the U.S. The towering cliffs on either side are colossal. I drove the Oregon side; the other side of the river is Washington. Towering cliffs dwarf the traffic along I-84 along the Columbia River. Yep! There was a Dale’s Roadside Diner in the Columbia Gorge! These mirror-like waters are very unusual along the usually windy Columbia Gorge. A ship along the gorge drive. It could be a tourist cruise, I guessed. Mt. Hood dominates the western view from the gorge. Once I turned south on I-205 to skirt the madness of Portland traffic, the beauty of the gorge was behind me and I dealt with heavy, metropolitan traffic the rest of the drive. I-205 turned into I-5 as I neared Al’s place and I continued to my turn off. I arrived at Al and Betty’s in Keizer, Oregon at 1230. I had to back down the street from the corner nearest them due to the tight quarters in their cul-de-sac. Al was there to watch me back in and to stop me at the back of their driveway. It was good to see them both, and we spent about an hour just catching up with each other’s news. Backed into Al and Betty’s driveway for the night. Plugging into their 30 amp receptacle all day and night pleased Big Blue as she’d been having to charge all those big house batteries only in the evenings with her diesel generator. After our visit I returned to the coach to edit some photos and to prepare to go out to an early dinner with Al. Betty had been dog sitting for Al’s granddaughter’s pooch, and she’d be by to pick him up, so Betty stayed home. We headed to McGrath’s Fish House in nearby Salem for an outstanding dinner of coconut prawns and red taters. It was preceded by clam chowder that could have been dessert. The dinner was, as always there, excellent. Al and I go back 60 years to high school, and we’ve enjoyed many fishing trips together. Click here for some great fishing adventures we’ve enjoyed. Back home we visited a spell as we enjoyed ice cream with Oreos crumbled and sprinkled over it. But by 2000 hours I was back in the coach editing photos, as usual, and writing this travelogue. I would be leaving about 0800 in the morning, and wanted to have a good rest. After editing photos and writing and watching a bit more history documentary, I called it a day at 2300. I was up around 0600 as usual and after morning chores, I prepared the coach for the road and was anxious to get underway. When I started the engine, Al and Betty came out to the coach and Al handed me a wonderful lunch of beans with bacon and ham, some cornbread, and a side of fried taters for my trip home. I thanked them for the nice stay and the great food. We went into the house for a few moments and I took a photo for the blog. I pulled out of their driveway at 0745. Just before I continued my trip, we got together for a photo. That’s the Tom Selleck look-alike, Betty, Al and Tommy the pooch. I drove a few blocks to a Mobil station that was selling diesel for just $3.26 and pumped on 76 gallons. That was the best price, according to an online search, I could find for miles around. And I continued through town to I-5 and headed south. I topped off the fuel again at Ashland where the last somewhat sane price would be found before I drove into Kalifornistan and its $4+ fuel prices. I pumped on 26 gallons in Ashland to fill the tank. The drive through Oregon was beautiful in spite of the dry areas – it was late September and it had been a long, hot summer. As I drove into Kalifornistan, I recalled the big backup my last trip when it took an hour and a half to drive 15 or 20 miles through an area at Dunsmuir where both directions of I-5 traffic shared the northbound lanes while the southbound lanes were being rebuilt. This trip, however, I drove through the construction zone with nearly no delay, and only a slight slowdown. What a relief! As I drove toward Redding, my original planned stop for the night, the outside temperature was 100° (again). I continued on to Willows, about 60 miles farther south, where it was “only” 94° as I pulled in at 1800. I ran the air conditioner most of the evening. Mt. Shasta just wasn’t her usual self after the long, hot summer. Pray for snow! It’s a long, steep decline into Kalifornistan in more ways than one! The construction zone I dreaded was scarcely a slowdown. My last trip it delayed me an hour and a half. Ugly, parched Kalifornistan. Pray for rain! I went into the store to do some grocery shopping so as to have what I needed when I got home and we wouldn’t have to make a special grocery run for me. My shopping included a couple beers, which I rarely drink these days, and a box of Crunch ‘n Munch, a favorite I seldom allow myself. But, after all, it was my last night on the road ’til the next trip. Back in the coach I edited photos, watched more documentary, and enjoyed the tasty beans and cornbread that Betty had prepared for me. What a wonderful dinner – I didn’t miss my usual frozen fare at all. I headed for bed a bit after 2200 and looked forward to being home the next day! I was up and at ’em at 0500, eager to be home after 18 days on the road, and 10 of those days were without my loving Trail Buddy. We talked on the phone every morning and evening, but that’s not the same as being together. I was ready to reclaim home, Honey, hearth, and hot tub! It was very mild in Willows at 0500, but I fired up the heater and the water heater because I am pretty tender. After morning chores I sat at the laptop and finished the prior day’s blog. At 0630, the earliest of any day that trip, I was heading home! I traveled in darkness for awhile, and found that enjoyable as I always did back it the trucking days. It is rare that I drive in darkness nowadays. So with that opportunity I shot a number of photos in the darkness and the results are posted below. Big Blue II along I-5 at daybreak. A photo of the Sutter Buttes, a small range in the Central Valley, taken at sunrise from I-5 with my digital zoom camera. NASA says the Sutter Buttes are sometimes referred to as the smallest mountain range in the world. Below: A less telescopic view of them taken from I-5 as I drove south toward home. More information here. The drive home was timed to take part in the madness of the Sacramento morning commute. One little fender bender caused a back-up for miles. And the drive home even beyond Sacramento was through miserable traffic – as it always is in Kalifornistan. Those empty, scenic back roads of the heartland were only a memory. It was so good to greet my dear Lavonne at home when I arrived a few minutes before 1000 hours. A warm, long hug assured me I was back where I belonged and it was a very sweet moment. And then… it was time to unload the coach. Lavonne had an appointment with her doctor and had to be on her way soon after I arrived. I started my day early because I wanted to beat the heat at home when I unloaded. So I got right after the job of hauling in all the stuff to clear out the coach. Then I dumped the holding tanks, filled the fresh water tank, and backed Big Blue into her RV sized carport in the community RV lot. We had made the trip successfully, and I think she was happy to be home, too. After 5,000+ miles and 18 days it was good to be home! Where to next?! Big Blue was happy to be back home, too. Big Blue ran like a clock the entire trip. Well… there was that slide issue and the charging issue, but such is the character of a complex motorhome. I would get those fixed real soon. The trip covered 5029 miles. It took 18 days and looped through 14 states including Kalifornistan, Nevada, Utah, Wyoming, Colorado, Kansas, Missouri, Iowa, Nebraska, South Dakota, Montana, Idaho, Washington, and Oregon. Big Blue delivered 8.5 MPG overall. I was comfortable and safe throughout the entire Iowa Loop. In the cold of Montana I was warm, in the heat and humidity of Nebraska and Missouri I was cool. I ate nearly every meal aboard, had my own bathroom, bedroom, kitchen and living room. I didn’t pay for one night at a RV park and spent every night at a Walmart except those nights we visited friends or family. I can’t imagine a better way to travel when time is not an issue. The trip was a real pleasure for this old man, and already I’m looking forward to our future RV adventures. Our RV adventures for the next three months would likely be nearer home. We plan to visit my sis in Gridley in October, then in November we’ll probably spend the Thanksgiving holiday at Craig’s in Stockton, followed by another trip to Gridley. And of course December will likely be a repeat visit to Craig’s and my sis’ place. But come January I’ll be raring to hit the road south into Texas for my annual Search for Sunshine! This entry was posted in Travel: Allen's, Travel: Chicken Runs, Travel: Gale & John, Travel: Interstate Adventure!, Travel: Oregon. Bookmark the permalink. How could your wifey play her word games on HER computer and you couldn’t get on the internet? Just doesn’t sound right. Sorry, Dale, I’m a literal person most times. Anyway, was wondering how your sister is doing? Well… how ’bout this: she has word games on her computer that don’t require the internet! My sis is doing about the same as our last visit. She can’t walk and her hubby works hard caring for her. It tough to see them living with that disability, but they seem to be doing as well as can be expected. We’re in Cheyenne tonight, and the ‘net connection is working fine! Thanks for the visit. Dale, I laughed so darn hard and long at some of your posts! Especially the “mugging”!! I clicked back to it and found it, and it just made me laugh all the harder! Your wry wording of fill ups, food eating…the liberating of 2 Coronas…maybe 3 just hit my funny bone the right way! Hi Sandy – That “mugging” was four years ago now and it seems so recent every time I drive through that crummy little town. As for those Coronas, I’ve been tempted since to buy a six pack, but just won’t due to the calories. I’ll stick with my vodka and calorie-free tonic water! Did your wife’s decision to fly home have anything to do with you passing the scene of the tragic accident again ? Hi Mel – No, she would have gone with me but since there was no family to see during my wandering, she chose to fly home even before we left. This will be her third time to fly home after our visit to the kids near Denver. Yep – all is well on the home front. 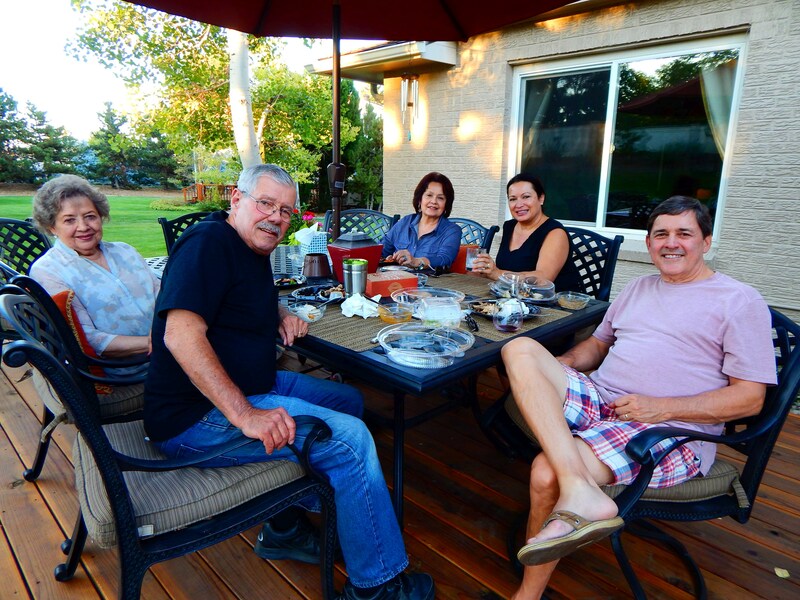 Thanks for the visit – it’s always good to hear from folks when they visit my travelogues. I think we may have passed you on Tue. While you were heading south on I-205 to I-5, we were going from I-5 to I-205 north on our way to a camping trip at Trillium Lake. So it’s possible that we passed each other on I-205 going in opposite directions! The timing was right – did you see an old guy in a Bounder that looked a lot like Tom Selleck? Had I known, I’d have stopped to say hello. I sure hated to leave Oregon the next day and drive to Kalifornistan, but that’s where home is – darn it! I went to a boarding church high school in Canyonville back in the 50s and early 60s. I love Oregon, and for the past 16 years since I retired I’ve tried to talk my dear Wifey into moving there. She never would go, but now that Kalifornistan has gotten so bad, we’d both like to but we’re too darn old for all the work involved. Thanks for the visit – I always enjoy comments on this site.